When Jon tells his stories, he sometimes exaggerates his stories so think of how you can embellish your story. Stories should take between 1-3 minutes to read out loud. We don't want anything too long or too short! 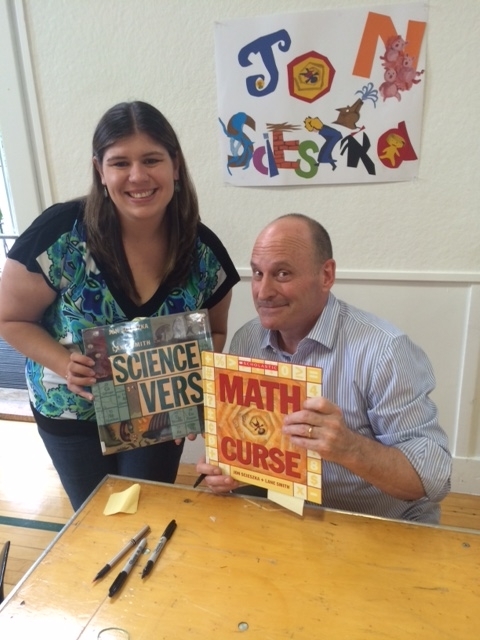 Although I have always enjoyed his books, meeting Jon Scieszka made me appreciate and love his books even more. He is one of the funniest people I have ever met (he even had me in tears when he told some of the stories from his childhood). Even though he autographed hundreds of books and met dozens of people, he was incredibly nice and gracious and he loved hearing all about my libraries and schools. I hope you can appreciate and love Jon Scieszka's work as much as I do! How did Jon Scieszka get so funny, anyway? Growing up as one of six brothers was a good start, but that was just the beginning. Throw in Catholic school, lots of comic books, lazy summers at the lake with time to kill, babysitting misadventures, TV shows, jokes told at family dinner, and the result is Knucklehead. Part memoir, part scrapbook, this hilarious trip down memory lane provides a unique glimpse into the formation of a creative mind and a free spirit. Watch a QuickTime trailer for this book. "Amoeba" Don't ever tease a wee amoeba By calling him a her amoeba. And don't call her a him amoeba. Or never he a she amoeba. 'Cause whether his or hers amoeba, They too feel like you and meba. What if a boring lesson about the food chain becomes a sing-aloud celebration about predators and prey? A twinkle-twinkle little star transforms into a twinkle-less, sunshine-eating-and rhyming Black Hole? What if amoebas, combustion, metamorphosis, viruses, the creation of the universe are all irresistible, laugh-out-loud poetry? Well, you're thinking in science verse, that's what. And if you can't stop the rhymes . . . the atomic joke is on you. Only the amazing talents of Jon Scieszka and Lane Smith, the team who created Math Curse, could make science so much fun. Three of Scieszka and Smiths classic tales which work in fun science and math lessons are now available in these deluxe, limited-edition paperbacks, each featuring French flaps. Full color. For use in schools and libraries only. Three friends, Sam, Joe, and Fred travel through time having action-packed, outlandish adventures. The snappy dialogue and classic "boy" humor in this series of chapter books will engage the most reluctant readers. Want to know more about Jon Scieszka? Visit the websites below!